I don’t consider myself to be an expert economist, or all that knowledgeable about politics so it’s fair to say for example I am not a regular viewer of Question Time for example. Looking back I am surprised how many hours my wife and I spent sat on the sofa at home watching the debates, or programs about the referendum. Perhaps it was because the football season had finished aside from the Euros which were the usual disappointment for anyone aligned with the flag of St George, but we found the coverage compelling viewing. We were both undecided voters, flipping from remain to leave and back again almost nightly, and often going in the opposite direction to each other. In the final 24 hours we both made up our minds and, as it happens, reached the same conclusion. We then voted on the Thursday which happened to coincide with our son being poorly which led to him being awake a number of times during the night. This in turn allowed me to quietly listen to Radio 5 every couple of hours and of course as the night wore on, and the result became clear, it was compelling listening. 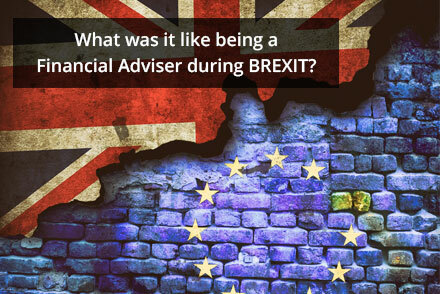 It was also increasingly emotional as the, and I don’t think I am exaggerating, collapse of the pound and dramatic predicted losses on the UK and global stock market started making the headlines, I was genuinely frightened in a way I simply cannot recall feeling before. I’ve done a few exciting things over the years such as skydiving and I regularly drive my Lotus around racetracks pretty quickly, but it didn’t feel anything like any of those. It’s impossible to put that feeling into words. As the clock ticked towards the sort of time when I would normally be getting up, and bearing in mind I wasn’t due to commute to the office as it happened, and with our son at last fast asleep, I settled back and started to write an email to go out to our clients as a part of the service we provide. It took a lot of effort to try and put the emotion aside and write something which was positive and supportive; after all the underlying message was that now was not a good time to panic as trying to sell out of assets that have already taken a bit drop and might fall further was rarely wise with hindsight. Looking back at that communication and having spoken to a number of our clients about it, I think we got the tone absolutely right. We suggested to those clients making regular withdrawals they may like to temporarily suspend their income, using their cash reserves instead, to avoid selling units at a low price and this was also well received (and good advice too, as markets have since recovered allowing clients to resume their income without crystallising any of their short term losses). Less than a week after the Brexit result drama, after the Prime Minister resigned and the opposition had got themselves into a pickle, and with equity markets still nervous, commercial property funds started making the front of broadsheet papers and the mainstream tv news coverage. A client rang me one evening to ask what the breaking news meant and since I was in the garden playing with our son, I had no idea funds were being suspended. A quick look in Twitter soon brought me up to date and I let the other members of the Gibson Lamb team know; it was very dramatic and if I am honest quite stressful because with equity markets falling, the pound falling and now property funds seemingly set to follow suit, we started to recall the Lehmans brothers collapse of 2008 and the dot com / 911 crash of 2000/2001. Interestingly we fielded a few calls from anxious clients, and one brave soul who wondered if now was an opportunity to invest some more money, but generally speaking there was not a sudden influx of enquiries. The wall to wall press coverage told them everything they needed to know and there was very little we could add than we hadn’t already said in our emails. As the days turned into weeks and the weeks into a month, Brexit became the new normal. Holidays abroad will cost more in future because of the value of the pound but more tourists should come to the UK because of the value of the pound; every cloud and all that. We now have a new Prime Minister, albeit without much of an opposition party at the moment it seems and Boris got a new haircut to go with his job of flying around the world being nice to people on behalf of the UK Government, which seemed to raise a few eyebrows in the aforementioned press coverage and TV news channels. I’m no longer watching Question Time or talking politics over the dinner table so it seems we are back in the old routine now and nothing much has changed on a day to day basis; equity markets in the UK and around the world are back to more or less where they were and in some cases are notable higher especially once converted into Sterling. However, we know big changes are coming. Given we are pension specialists, big changes to legislation are something we are used to dealing with as the Rules have been changing constantly for the 20+ years or so I’ve worked here at Gibson Lamb. Perhaps that’s why we’re all a lot calmer now? As I type property funds remain suspended and that isn’t ideal but perhaps we can look into that situation in a separate blog. It has been an incredible few weeks that is for sure. I wonder what the next few weeks, months and years will bring. Time to look for a Question Time that discusses the American Presidential Election maybe?